The Niagara Region is known for the beauty and wonder of its world-famous waterfalls, but the area also offers a lot in the form of expansive parks, picturesque vineyards, and championship golf courses. If you’re a golfer who wants to tee off in Niagara this summer, make sure to visit any of these amazing Niagara golf courses. Legends on the Niagara is one of Canada’s premier public golf destinations with 2 championship courses and a par-3 executive course. The facility’s Battlefield course was designed by renowned Golf Architect Douglas Carrick and features a great mix of undulating fairways, forest, brush, and links-style holes, while the Ussher’s Creek course designed by Golf Architect Thomas McBroom offers thick stands of deciduous trees, wetland hazards, and impeccable conditioning. And don’t forget to enjoy Legends’ 45-acre driving range, state-of-the-art training academy, and magnificent clubhouse facilities. Experience one of Canada’s most renowned public golf courses at Whirlpool Golf Course, located along the breathtaking Niagara River and Gorge. The course was designed by famous Golf Architect Stanley Thompson and is an 18-hole masterpiece that golf lovers won’t want to miss. And when you’re finished golfing, make sure to visit the Whirlpool Restaurant and Lounge overlooking the 18th hole and relax over a casual and delicious meal featuring local Niagara wines. Located along the Marineland Parkway just minutes from the Niagara Falls tourist district, Thundering Waters golf course offers incredible golfing experiences for players of all skill levels. 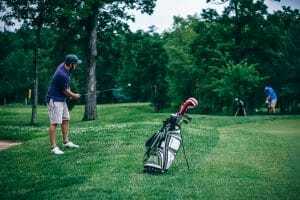 The 18-hole golf course was designed by golf legend John Daly and is a beautiful and convenient golfing destination for people staying at a nearby Niagara Falls hotel. Oak Hall is a par 3 golf course located on the grounds of the historic Oak Hall Estate. It’s an ideal choice for beginner golfers and those looking to work on improving their short game. The Oak Hall golf course is 1,050 yards and contains very few hazards, which also makes it the perfect course for people who only have a little bit of time to spare. And its location on Portage Road next to Dufferin Island means that it is just a short distance away from the magnificent Horseshoe Falls. Rockway Vineyards in St. Catharines, Ontario is a golfing, wining, and dining destination that is perfect for a weekend getaway. With a beautiful 18-hole golf course, 10,000 sq. ft. club house, and fantastic restaurant overlooking the course, it offers unique and exciting golfing experiences unlike anywhere else in Niagara.